In this section, you will find the spare parts for Deutz tractors. 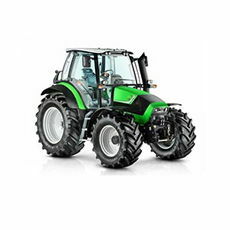 You can search for them by the product you are interested in and/or your Deutz tractor model. The products that appear after the search show two reference types: the Deutz OEM reference and the Fuster reference for the spare part manufactured by Repuestos Fuster with the same guarantee as the original, but at a reduced price. At Repuestos Fuster, we are dedicated to manufacturing non-original spare parts for the Deutz tractor models. They are quality spare parts that follow very demanding controls throughout their production process: from the selection of the materials used to the part finish and final packaging and labelling. The number of Deutz tractor parts we produce is very high and they provide a solution to about 9000 different commercial applications. Subsequently, 99% of the references are available in our stock for sending within 24 hours. Among these are parts which are difficult to find today, either because of their age, their price or their technical complexity. We want Deutz tractors to be working again in the shortest time possible because we know the damage done if it is left standing in the field. So we try to provide the spare part integrated with its accessory parts (gaskets, screws, seals and nuts, for example) to facilitate the complete assembly and proper start-up without having to go to more than one supplier; thus bringing forward repair periods in addition to lowering costs. Finding a specific spare part for a Deutz tractor model on our website is very easy and can be done in different ways. Firstly, using search engines, you enter the reference if you know it, the product, the Deutz brand and/or tractor model. Secondly, you can search for a part by navigating intuitively through the Deutz tractors spare parts menu, where we show all available products and classify them into eight part groups for easy finding (Body and cab, 4WD front axle, 2WD front axle, Electrics, Clutch, Linkage, Engine and Transmission and power take-off). These groups are divided into different subgroups where the products are found; when you click on them, the Fuster and OEM references are shown for you to place your order.